Conceptual notes and technical requirements for Graz-Stadt Drift, a Drift Theory structured improvisation for the Terminal Quartet. Graz-Stadt Drift is a site specific structured improvisation conceived of and performed by the Terminal Quartet, originally founded in Australia by composer / producer, Andrew Garton. 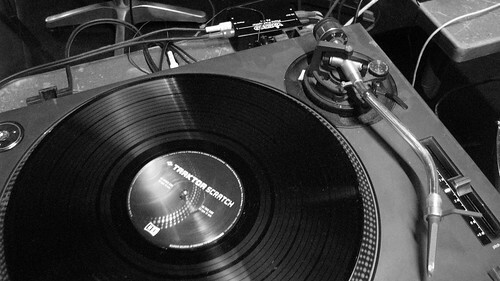 Graz-Stadt Drift was performed by the Graz chapter of the Terminal Quartet: Andrew Garton, Josef ‘Seppo’ Grundler, Peter Venus and a turntable. Each of Graz-Stadt Drift’s four movements is concerned with individual impressions of the city of Graz as described by the Quartet’s performers. There are its many festivals, jazz venues, electronic music events and a community radio station. The University for Music and Performing Arts, the Institute for Electronic Music and Acoustics and University for Applied Sciences are just three of the important learning centres that draws musicians and composers from around the world to this city.Graz has been described as boring, inspiring, conservative, liberal and in parts, unpredictable and dangerous. The people are said to be supportive, encouraging and in general, helpful and curious. It is known as the retirement village for the post-war generation and the first school of jazz in Europe was founded in there. Graz was the European city of culture in 2003 and to this day boasts the largest PD (Pure Data) user base of any city in the world. A healthy open source movement maintains itself through the efforts of a handful of people – organisations such as mur.at andESC im Labor being a catalyst for much of the public access and open content consciousness raising. It is home to a growing underclass of east European refugees, many who resort to begging, kneeling or sitting on the pavement, some who rock to keep themselves warm, others whose face change from nonchalant to desperation in mere seconds. A black community seems to have literally cornered the street market for Austria’s street press, some so eager to part with their magazines they follow anyone offering the barest of glances. Graz is geographically situated close to the countryside, but is said to have the worst air of any city in the EU. An expanding urban population, satellite shopping centres and malls drain many from the ceity centre that is largely closed by 8pm and near vacant by 10. For the uninitiated one must look hard for a place to take a quite few moments in at that time of day. Dividing the city in two is the mighty Mur, 295 km of its 465 total length runs through Austria. Graz is the largest city on the river where it continues to race on to Slovenia, Croatia and Hungary. Graz may not have the dynamism of Vienna, but it offers space for creative reflection and practice, proximity to the countryside and the promise of community amongst family and friends who inform, encourage and stimulate each other. Create an individual movement based on ones personal impressions of the City of Graz. Four movements in all will be created with a fifth constructed during the performance of the work. Ensure the piece can be performed for at least 5 to 7 minutes and enough resources available to contribute to a 20 minute improvised movement with all members of the Quintet. Movements are composed, constructed and developed in isolation from other members of the Quartet. Unless required for technical reasons, or as defined by the context or theme of Graz-Stadt Drift, neither performer may be aware of the strategies each may employ to perform their movement. Technical requirements to be ratified in scheduled workshops. The fourth member keeping the entire Quartet in synch. The Quartet will perform each movement one by one at three to five minute intervals with an additional three minutes (drift sequences) within which to interact with the next performer. In short, performers have each three to five minutes to perform their movement and three minutes to drift into the next. The order in which each movement is performed may be defined by the composer prior to, or allocated at the time of a scheduled performance of the work. However, this is not mandatory. Depending on technical requirements of Graz-Stadt Drft, it may be necessary to define an ordered arrangement in advance. vinylcontrol~: an external that allows controling pd- or max/msp- (as well as sndobj) patches using timecode vinyl. Jackdmp: Low-latency audio server for uniprocessor and multiprocessor machines. (Win/OSX/Linux). xwax: open-source vinyl emulation software for Linux. ms.pinky vinyl emulation for windows. TERMINAL QUARTET performs Graz-Stadt Drift at Stockwerk Jazz, 29 Jan.
Graz-Stadt Drift is a site specific structured improvisation conceived of and performed by the Terminal Quartet, originally founded by Australian composer / producer, Andrew Garton. Terminal Quartet’s debut appearance in Austria will be supported by the Garton Zeininger Duo. This performance would not be possible without the support of Stockwerk Jazz and Seppo Gründler. Andrew Garton’s appearances in Austria have been made possible with the support of Reni Hofmüller (ESC im Labor), Jogi Hofmüller (mur.at) Doris Carstensen (University of Music and Dramatic Arts Graz), Elisabeth Zimmerman (KunstRadio) and Grant McHerron (apc.au, Australia). Andrew Garton’s appearances in Austria have been made possible with the support of Reni Hofmueller (ESC im Labor), Jogi Hofmueller (mur.at) Doris Carstensen (University of Music and Dramatic Arts Graz), Elisabeth Zimmerman (KunstRadio) and Grant McHerron (apc.au, Australia). Terminal Quartet performances are comprised of collaborative, process-based works that set up interactions between the sound material of four composer / performers which attempt to ‘embody’ ideas about the nature of change in the world around us.